Far too soon to be posting again, but I must share the glorious indigo that has been pouring into my life this week. Today is Boys’ Day, the 5th day of the 5th month when families celebrate their sons. 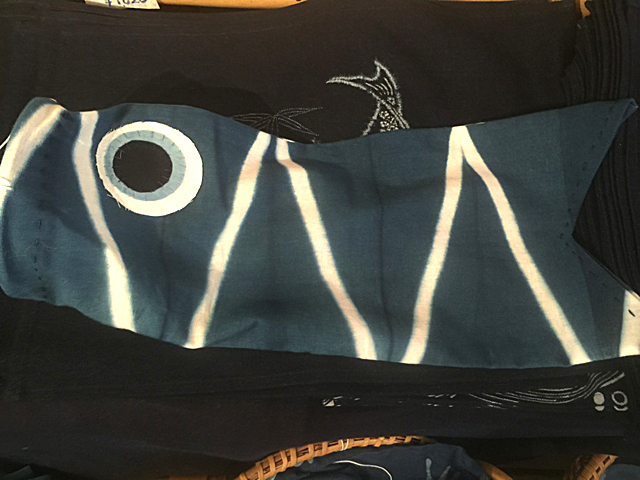 Colorful carp banners fly in all the skies of Japan, signifying courage and bravery. The sight of lines of brilliant carp banners strung over rooftops and even rivers gives great joy. 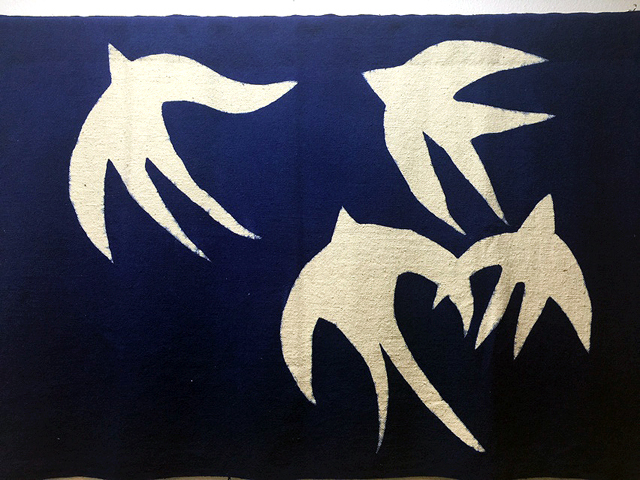 At Blue & White our banners are indigo, cotton dyed blue and sewn by Ai Kobo, a workshop for people with special abilities. And needs. And one of their needs is to not only make things, but share what they have made with the outside world. They get plenty of this at Blue & White. The whole world comes to see what they have made. 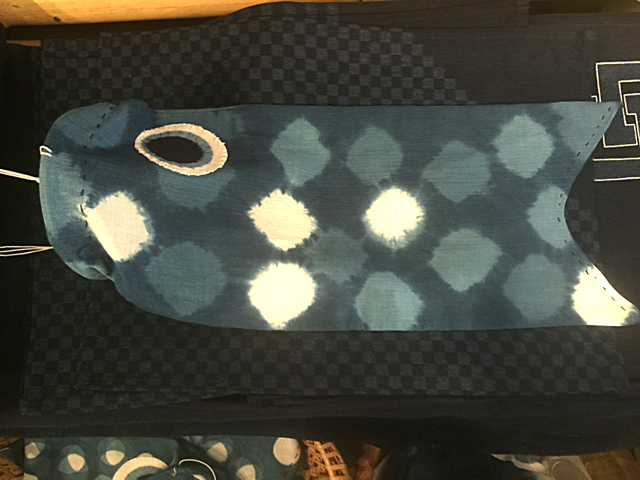 Indigo is happening elsewhere in Tokyo this week through May 18. 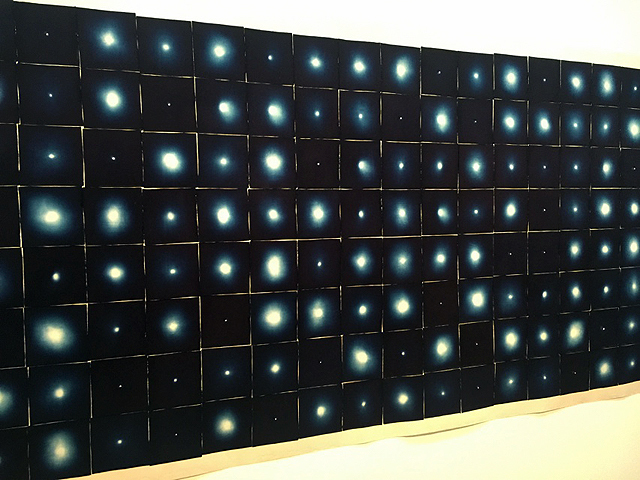 Above, a brilliant composition of small indigo squares with points of light collaged together into an indigo universe by Fukumoto Shihoko of Kyoto. 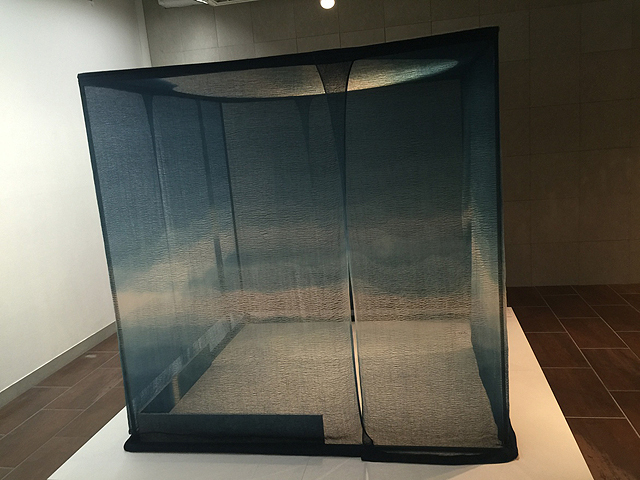 Below Fukumoto san’s Indigo Space within a gossamer Tea House. 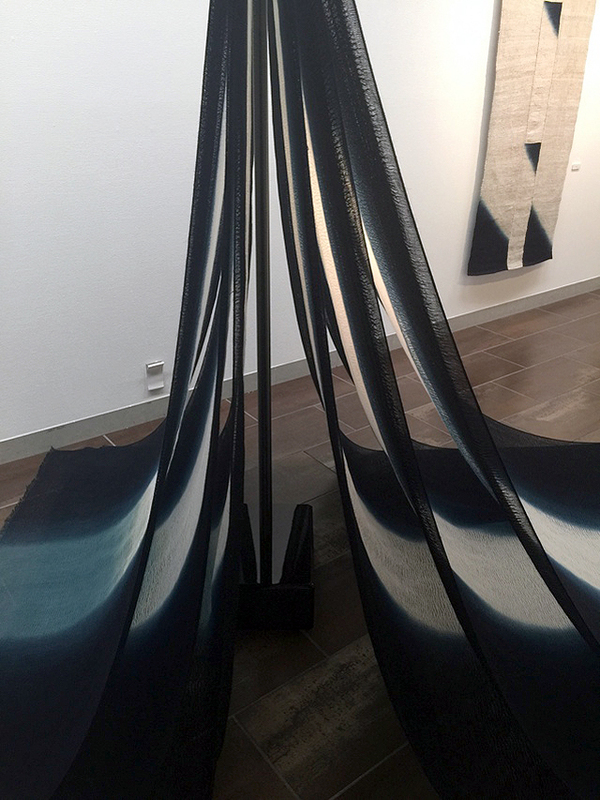 Photos cannot capture the magic of space or the intensity of the indigo. 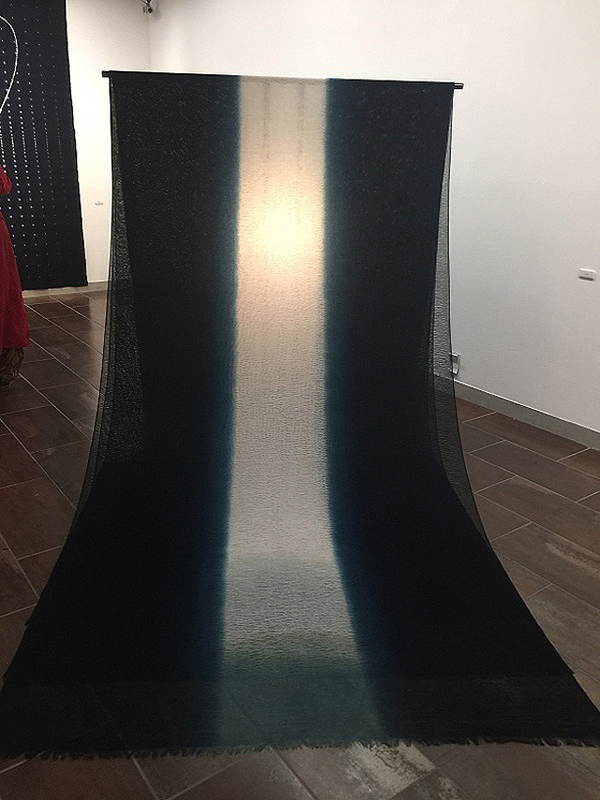 Fukumoto Shoko’s multilayered lengths of diaphanous open weave cotton at Takashimaya Art Gallery, Nihonbashi, 6th floor. 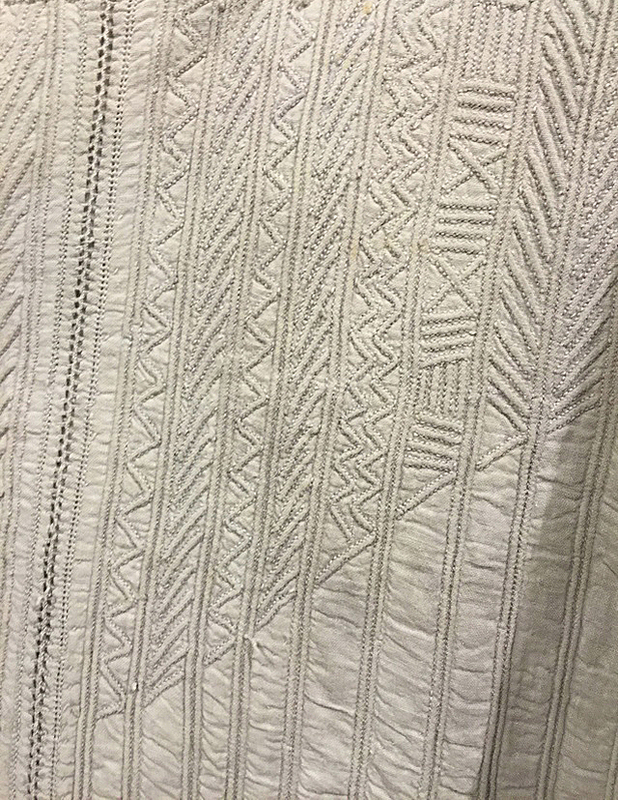 Details of Afghan Jacket show the subtlety of white on white. 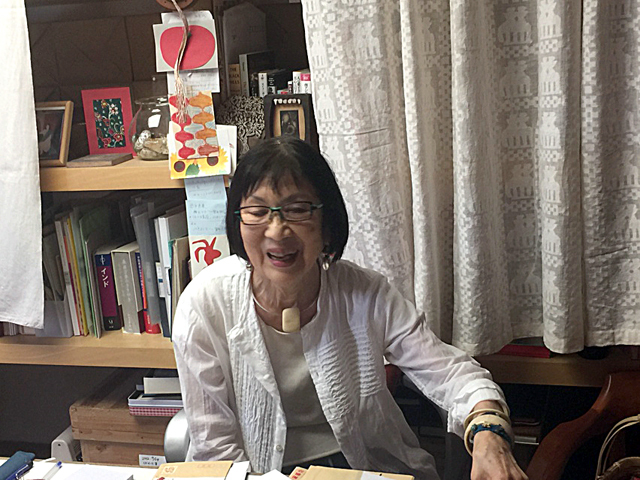 The incredible Hiroko Iwatate in her Museum of Folk Textiles office in Jiyugaoka. Her remarkable museum is filled with treasures she has single mindedly collected in Asia and Africa for the last 50 years. Exhibits change 4 times a year. 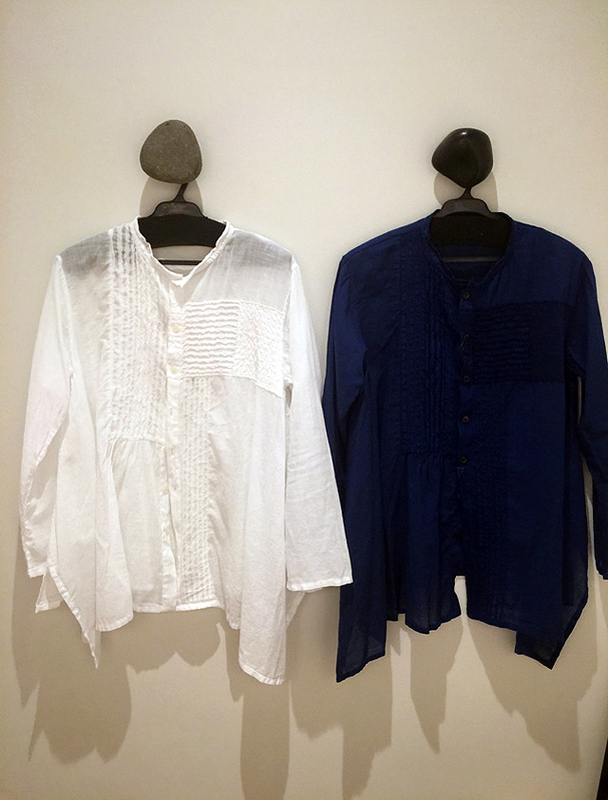 This season features White on White (blue is hiding) – brilliant! 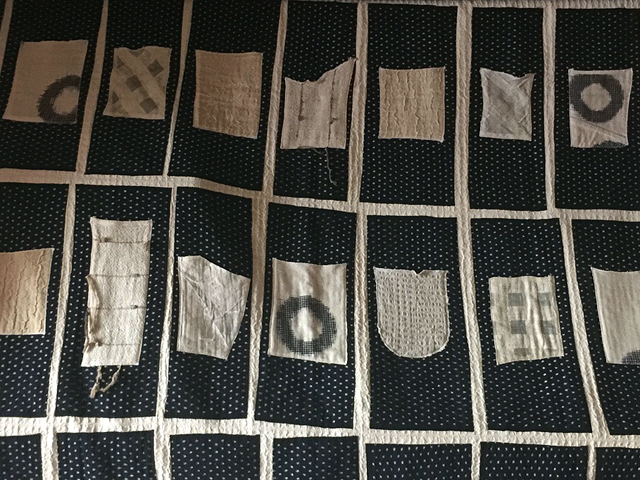 Textile collage of pockets of intriguing mostly white textiles on indigo kasuri by Ayako Takakuwa 30 years ago, hangs in the office of Hiroko Iwatate atthe Iwatate Museum of Folk Textiles in Jiyugaoka. 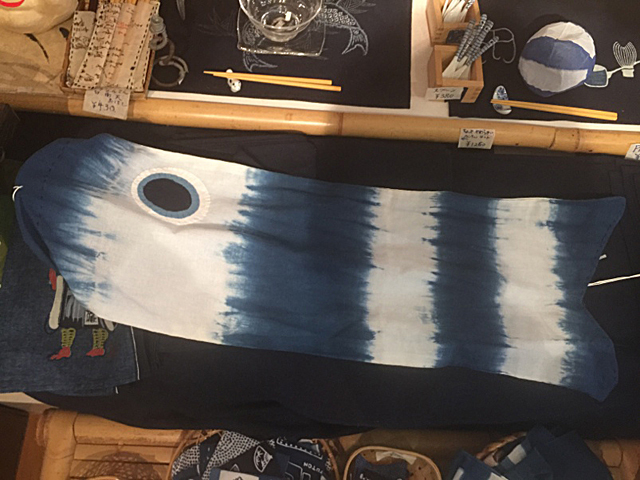 Blue & White shirts at Plantation in Jiyugaoka. Of course I chose the blue. 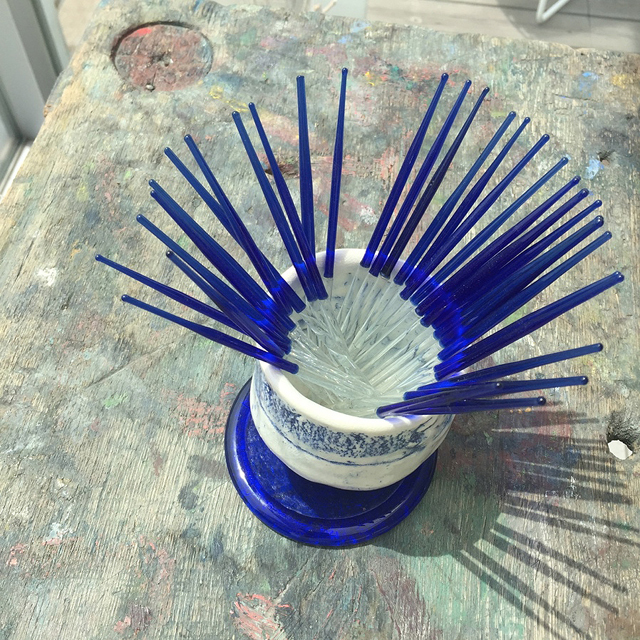 Eye swabs, glass, early 20th c. OUCH! Recent Flea Market find. What exquisite photographs! I’d love to learn more about Ai Kobo, the workshop for people with special abilities. The banners are gorgeous. I keep telling Ai Kobo that they need an English brochure. Maybe your remark will be the push they need. And yes. They eye swabs are a frightening instrument for shaky hands. Let’s go for cocktails ! Wonderful as always. Keep them coming as often as possible. Amy—You are always so ahead of the curve! I’m reading your May 14 post in Seattle on May 13. Love experiencing Blue & White from afar. P.
and of course the self indulgence of reaching out to friends who actually read to what I write. Oh! Blue-ti-ful! And love the whites too. Thanks so much for sharing images of people & objects that are so special. 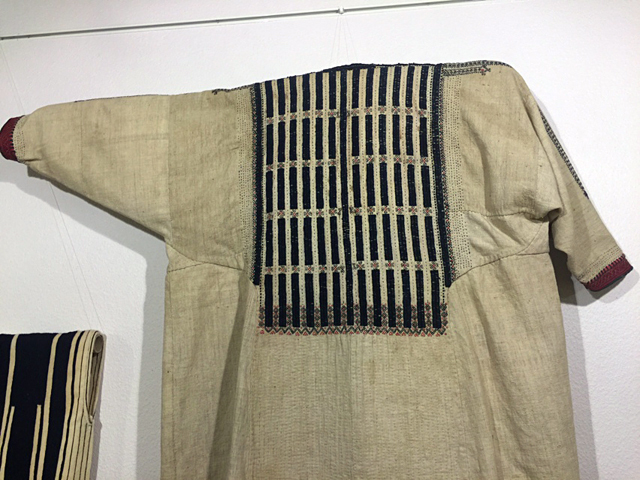 The textiles are so wonderful — they make me miss Japan. 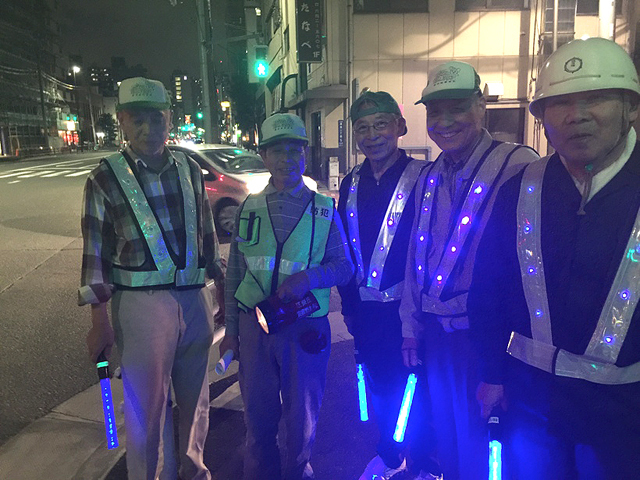 And the gentlemen in the neighborhood watch group with their reflective vests and light sticks are adorable. Sending gratitude and good wishes from Pasadena, Amy!